Plenty of sunshine is shining brightly across Central Alabama as we have reached the midday hour of this mid-February Hump Day. 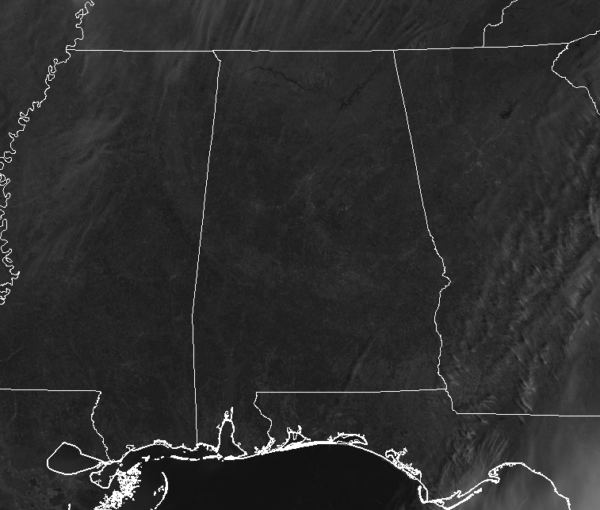 We do have some very thin high clouds over parts of the area, but they are very hard to detect on the visible satellite image at this time. It’s still cool across the area with temperatures in the upper 40s to the upper 50s from north to south. The cool spot is Cullman at 49 degrees while the warm spot is Eufaula at 58 degrees. Birmingham was at 54 degrees. While afternoon highs will be much cooler than what we have seen over the past week, we’ll have plenty of sunshine across Central Alabama for the rest of the afternoon and into the early evening hours. Highs will be close to normal for mid-February, topping out in the mid-50s to the lower 60s across the area from north to south. We’ll continue to hang on to those clear skies throughout the evening and into the late night hours, but some clouds will begin to move in after midnight. Overnight lows will be in the lower 30s to the lower 40s from northeast to southwest. Well, after getting a short break from the rain, shower chances will be on the rise as we get into the late evening and the late night hours on your Valentine’s Day. The good news is that we’ll stay dry throughout much of the day but clouds will be on the increase. The shower chances during the nighttime hours will be small, only around 20-30% from southeast to northwest. Afternoon highs will top out in the lower 50s to the mid-60s. The week of February 17th-22nd has been declared Severe Weather Awareness Week by Governor Kay Ivey. NWS Birmingham, Alabama EMA, and other supporting organizations are asking for help to provide the public with severe weather safety information, and the AlabamaWx Weather Blog team will be glad to help. We’ll have special infographics to go along with each severe weather safety post that is made throughout the week. Governor Ivey has also declared the weekend of February 22nd-24th as an Alabama sales tax holiday for severe weather preparedness items. 1889 – It was the coldest morning of record along the Gulf Coast. The temperature dipped to 7 above zero at New Orleans LA and Pensacola FL and plunged to -1 degree at Mobile AL. The mercury dipped to -2 degrees at Tallahassee, the coldest reading of record for the state of Florida.